Timber Solid Wood Door « Global Market Insights, Inc. The two essential factors that are likely to positively leverage fire door market include the rising concerns over safety and a major requirement to reduce property damage due to fire outbreaks. The thriving construction sector along with hefty government funding for infrastructural growth is projected to create lucrative avenues for this business. The distinct types of fire doors manufactured by business players facilitate a reduction in the spread of smoke between two sections of a building. In addition, companies have been trying to manufacture products equipped with eco-friendly protection technology, which is expected to elevate the popularity of fire door market in the oncoming years. The commercial construction sector, one of the most vastly developing growth grounds, will be primarily responsible for the expansion of the fire door market. Of late, consumer preferences have undergone a vast change, teetering toward extreme safety and security in commercial spaces, augmenting the demand for fire doors. Not to mention, technological developments are now at the forefront with respect to the design and development of safety arrangements, that would further augment the commercialization potential of fire door market from commercial applications. Commercial establishments such as malls, hospitals, multiplexes, and the like have been experiencing widespread demand for fire protection products in order to reduce the loss of human lives and property. In recent times, fire doors even come with improved security systems and are considerably lightweight, thus enhancing their demand. As per estimates, commercial application is the dominant application segment in the global fire door market and is anticipated to observe a commendable growth rate over 2018-2024. With new commercial construction projects on the radar in tandem with a stringent regulatory landscape, fire door market from commercial applications is set to traverse alongside a highly lucrative path in the years ahead, specially across continents such as APAC and MEA that have been investment hubs for travel and tourism companies lately. Undeniably, APAC is one of the most profitable growth avenues for the global fire door market. One of the principal reasons for the same is the expanding construction industry in the region – specifically commercial construction, owing to the region’s economic growth. Not to mention, the continent has also been experiencing a popularity rise as far as tourism prospects are concerned. This factor, in tandem with the changing consumer lifestyles that has led to the construction of numerous commercial spaces demanding safety features, are certain to impel APAC fire door market. 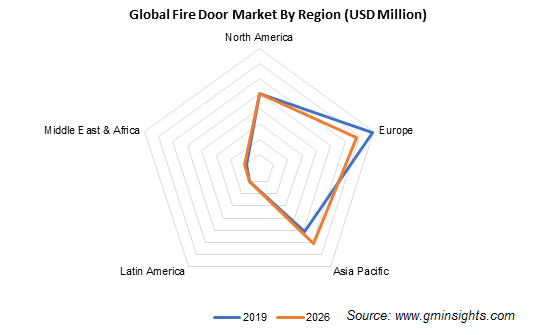 As per estimates by Global Market Insights, Inc., APAC fire door market size is slated to depict a CAGR of 7.5% over 2018-2024. The region is also characterized by a strict regulatory landscape that mandates the installation of security features to reduce property damage, that would further help escalate APAC fire door market share in the years ahead. Market players are focusing on extensive business expansion by executing major growth strategies. One of the key tactics is that of product value addition, which plays a great role in augmenting fire door market revenue, since consumers primarily look out for innovations in the already available products. In addition, forming strategic alliances with other companies is also undertaken by fire door market players, which include The ASSA ABLOY Group, Mesker Door Incorporation, Chase Doors, Howden Joinery Group plc, U.K fire doors Limited, Nihon Funen Company Limited, and Republic Doors and Frames, and Essexford Joinery (Fire Doors) Limited. This entry was posted in HVAC and Construction and tagged Aluminum, APAC Fire Door Market, Block Board Core, China Fire Door Market, Europe Fire Door Market, Fire Door industry, Fire Door Market, Fire Door Market 2018, Fire Door Market 2024, Fire Door Market analysis, Fire Door Market forecast, Fire Door Market growth, Fire Door Market outlook, Fire Door Market PDF, Fire Door Market report, Fire Door Market research report, Fire Door Market share, Fire Door Market Size, Fire Door Market statistics, Fire Door Market trends, Fire doors market, Glass, Global Fire Door Market, Gypsum, Particle Board Core Door, Steel Honey Comb Door, Structural Composite Lumber Core, Timber Solid Wood Door, U.S. Fire Door Market, Vermiculate Boards.